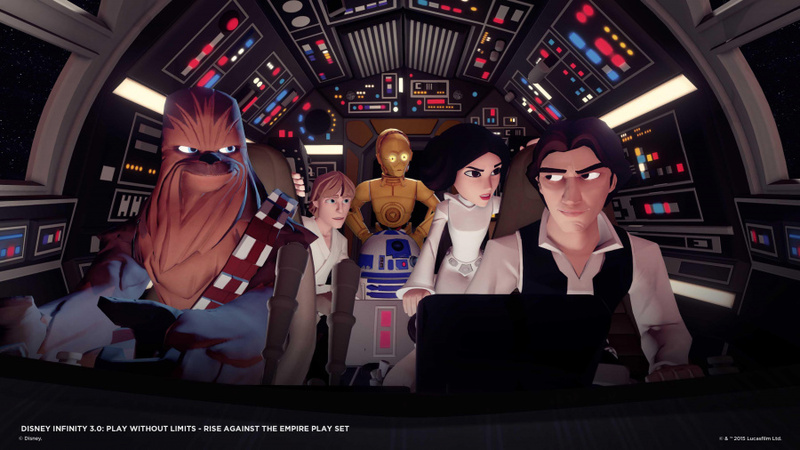 Disney Infinity 3.0 has been announced and features play-sets and characters from every Star Wars movie, alongside improved cross-franchise compatibility and play-sets for Inside Out and Marvel. With a strong announcement from Lego Dimensions and expected news on the next Skylanders game, this is an impressive response from Disney that focuses not only on their franchises but also offers better player choice at retail. The Star Wars: Twilight of the Republic (Episodes I-III) set takes place in the height of the Jedi's powers, where players will use the Force and Lightsabers alongside Ahsoka Tano, Anakin Skywalker, Obi-Wan Kenobi, Yoda and Darth Maul. The Star Wars: Rise Against the Empire (Episodes IV-VI) takes players on galaxy-spanning missions with Luke Skywalker, Princess Leia Organa, Han Solo, Chewbacca and Darth Vader, piloting X-wing fighters or the Millennium Falcon to fight stormtroopers, or exploring land-based missions on planets like Tatooine, Hoth, and Endor. Episode VII has few details revealed at the moment so as not to spoil the film. In actual fact there were no concrete details apart from its inclusion this Winter. A nice new feature this year is that you can use all of the Star Wars characters in any of the Star Wars playsets. This improves on the Marvel playsets that enabled some characters to cross over. Disney Infinity 3.0 will also add new Toy Box Hub feature to categorise games into genres like platformer, racing, and farming simulation games. This will make it easier to find a certain type of game. Two new multi-player Toy Box Expansion Games are also included, action-adventure gameplay in Toy Box Takeover and kart racing in Toy Box Speedway. Ahsoka Tano and Anakin Skywalker character figures, and a web code card that unlocks content for PC and mobile devices. 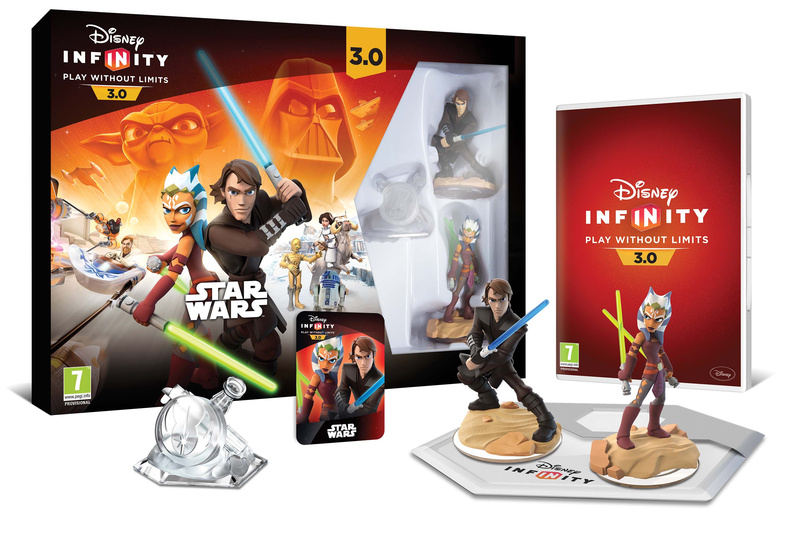 Perhaps my favourite change this year (Star Wars not withholding) is that players who already have Disney Infinity 1.0 or 2.0 can purchase the Disney Infinity 3.0 Video Game Disc on its own and use the base they already own. This is another big step forward for the franchise as it avoids consumers having to purchase the complete starter pack again to play Disney Infinity 3.0. It's also a nice touch for Wii players who have upgraded to the Wii U but still have their Wii Infinity Base. They can simply buy the 3.0 disc and to get playing the new playsets. As expected, all figures and Power Discs from the previous editions of Disney Infinity will be compatible in the enhanced Toy Box and, for the first time, Power Discs will be sold in labelled franchise-specific packs of four. This suggests that Disney is dropping the wallet bashing blind pack approach of last year in favour of enabling consumers to choose which Power Discs they purchase. There is a lot to take in here but on first impressions this offers a more comprehensive Star Wars experience than some expected and with features that give consumers more choice over how they play. Of course then there's Marvel and Inside Out to get our heads around as well. Disney Infinity 3.0 will be available in the Autumn and is being developed by Avalanche Software in partnership with Ninja Theory, Sumo Digital, Studio Gobo and United Front Games. It will be available for the PlayStation 4 and PlayStation 3, Xbox One, Xbox 360, Wii U, PC and iOS/Android devices. I am interested to know how well Disney Infinity sells on the Wii U because they sure have no problem porting this title across while others seem to skip our system completely. Disney Afternoon as next year's big new inclusion? So in regards to all characters can go in all Star Wars levels... Basically a Lego Star Wars: Money Grab Edition? I have a hard time with all these toys-to-life games.... Too expensive. £45 on Wii U for that Starter Pack. ... I'm gonna have to buy this if I ever want any sort of Star Wars action on my Wii U, right? This better turn out to be as awesome as that trailer. All I need is to listen to John Williams' score and I'm happy. I don't have to buy a thing. I just got Disney iInfinity 2.0 recently and it was underwhelming on the console version. The PC version was great though. I'm not getting this though since I just got the game. But hey, at least you can get those power discs and see what you're getting. That might actually make the game more tempting for collectors and the general audience. This is definitely intriguing and looks cool.......but the chances of me actually getting this are approximately 3,720 to 1. Eh boy. Star Wars trumps everything. If I get my employment situation back in order, these will be on the radar. It's not just Star Wars though, there are some key improvements as well: still sticking with same base, no more blind packs, mixing all Star Wars playsets, and most promising they brought in more studios to work on the Playsets... plus Tron. Weird, though that the current and successful family friendly Star Wars Rebels is nowhere to be seen. I guess with 3 playsets already and The Force Awakens release it will have to wait until next year. The newly announced Star Wars DI 3.0 & Lego Dimension stuff will all be slightly forgotten when Nintendo announces @ E3 that every Amiibo will be playable in Mario Maker and that they're releasing a spin-off 3DS game called Mario Player that will allow 3DS owners to play fan made Mario levels on their 3DS.............speculation! This sounds pretty good, a Star Wars set may just be tempting enough to get. @dkxcalibur That Mario Player rumor sounds intriguing. Having a "Mario Player" for Wii U as well makes sense (as a free download). I can imagine sharing Mario Maker levels with others who have Wii U systems without having to buy Mario Maker. My office has a Wii U, so would be fun to create and share levels to have co-workers try and beat . As for Disney Infinity, I considered trying out 2.0 to see if my son would enjoy it. It just seems "meh" to me; my son didn't really find it exciting either (granted, he's only three, but I think he seems to enjoy playing "New Super Mario Bros. 2" more than Disney's sandbox). Pass. Never got into the Disney Infinity series and probably never will. amiibo will be my only toys for games. The "toys to life" craze is getting closer and closer to a crash. Never played any of those type of games, but Disney... said it before and I'll say it again, give me Captain Eo and I'm IN! As with the other editions, I will get the figurine(s) I want and ignore the rest. @Ninty4thewin The 3DS and Wii U can only scan one at a time but I guess they could figure something out. But yeah, mostly money. I'm a bit skeptical about this, since the first game made it a mandatory that only specific characters could be used for their level packs and other only in the toy box, which was a bit of a downer for me. Now I don't know how they handled it for 3.0, but I think I won't buy this one as I haven't 2.0 since I'm not a big Marvel fan. Make a Boba Fett figure and I'm sold! I have the 2.0 and the guardian of the Galaxy. I would not mine this, Star Wars trumps everything. I would love to see a Jabba or a Ewok, but that's old school. This is not on my radar, but is evil because I want it. This is a bank account depletion. Must...resist...urge...to buy...every single Star Wars character...I might actually have to get the game now. I hope and think that this will be the last Disney Infinity game. I hope so because my wallet is practically crying out in pain, and I think so because I honestly don't know what 4.0's big franchise would be. @bezerker99 Never tell me the odds! Will be picking this up at launch, though I'm not sure how many extra figures I will pick up at launch. Olaf, and Tron characters for sure. I'm glad I passed on the digital only Tron figures of 2.0 as you had to buy them separately on iTunes and PC, yet all other character codes activate cross platform (strange). I'm still thinking that C-3PO and R2-D2 will not be playable figures but rather support characters. As for the game itself it looks to be pretty good with the talent they are bringing on board. The games themselves have been good, but they could definitely use help with their racing mechanic. So Mickey, Minnie and Olaf don't do a thing, eh? No Disney Classic Universe, just that useless sandbox to mess with...I had enough of that with 2.0, thanks. @Shiryu Unless you want to turn to the dark side and buy a PS4... but yeah there doesn't seem to be anything else for Star Wars on a Nintendo platform. I'm fairly optimistic that with help from Ninja Theory, Sumo Digital, Studio Gobo and United Front Games that Avalanche can produce a decent game to represent Star Wars. @Nico07 I am currently not so pleased with the fact that "Battlefront" will not have space battles or a single player campaign (unlike the previous "Battlefront 2" that came out over a decade ago). Since the game the video below remains my al time favourite Star Wars game, I am far more happy with this trailer from "Disney Inifnity 3.0" than the EA's current one. Ah, Disney Infinity. Pay without limits. Typo fully intended. @CharlyDunst It would be nice if all characters could play anywhere, but in 2.0 they added Toy Box tower defense and dungeon crawler modes for both Marvel and Disney respectively. This gave every character a structured set of levels to play through. They also added a skill tree for each character so that the experience you would earn could be put to use and you had to decide what talents to buy as you can't purchase them all. The racing though in all Infinity games has been at best pretty pathetic. I'm hoping with some more outside help this time that the game will be pretty good. @Shiryu I agree with you on Rogue Squadron, Factor 5 and LucasArts made a great set of games back in the day. The new Battlefront looks okay, but like you mentioned I don't expect much more than a Star Wars skinned Battlefield. And with EA publishing... probably a broken game for several months. Holy cow, what on earth did they do to Luke Skywalker and the others? Clone Wars' artstyle fits this game well, but the movie characters...? Not so much. Please tell me that Dipper and Mabel will be in the game, Gravity falls deserves some figures! So glad it's not just Clone Wars, but is actually the Star Wars movies. i may get amiibo if i buy a NEW 3ds but i wont buy disney infinity. not my handheld game to buy, i may look into a xbox 360 version or may not get it at all. I'll be very happy if it turns out as exciting as the trailer! Since Wii U isn't getting Battlefront, this could be the next best thing in terms of content and amount of playability. Just give me Darth Vader and Jar Jar figures, and I'll be set! I was going to pass on this one, but after hearing all of this - all movies being playable, all characters across said movies, no need to get another starter pack, and another Marvel set being included, I might just look into this. Good thing it releases in fall - my birthday's then, so I can use possible birthday money towards this. I'm more curious of upgrades to the system. Any new modes, additional skill trees and level caps, maybe downloadable worlds with stories that allow any characters, etc. reasons to get figurines that don't have playsets. Including older ones, some cool figurines seem like they'll never get much use at this point. @ShadJV Now that would be a great idea. Like that, older figures or figures without any playsets could get a nice world to play within. @Angelic_Lapras_King Yes, I couldn't agree more. I have mentioned the Disney Afternoon multiple times here in the last few days. I would love to see Darkwing Duck and DuckTales amongst others. Love it, and my kids will too. Infinity has supplanted Skylanders in my house. Kids actually like the creative/unstructured play of the toybox. And we just finished our first family viewing of Star Wars I-VI, so yeah, we're ready. But where's Padame? @MrWalkieTalkie yes, yes totally agree. Couldn't agree more best idea ever!